The Hathor SIX Tool Presetting machine is designed completely free-standing on its own integral base; Hathor SIX features ground granite and stainless steel construction combined with a large digital camera and touch screen menu system – these new electronics provide operational and functional simplicity that is second to none. The precision spindle system is fully interchangeable and utilises a one piece cartridge - eliminating the need for adaptors and the errors associated with their use. 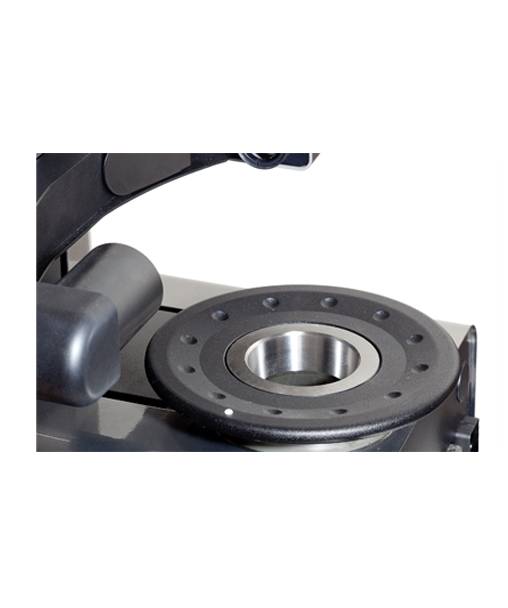 Incorporated within the spindle is our innovative universal mechanical clamping system with electronic tool clamping confirmation. Also included with our Hathor SIX model is our TdSIX software package. Working via your DNC system, TdSIX converts measured tool data into CNC code for direct loading into the machine controller and associated tool offset pages. The Hathor SIX is the second of three models which are manufactured to order. For a more prompt delivery of a stock machine the E346i, E460N, Kyhan and Amon Ra, as our four standard models, are always readily available directly from the Euro Centre. self-levelling supports in non-deformable steel. Taylor Hobson res.1μm/Mt. electronic millesimal level. ISO/BT Interchangeable rotating spindle-holder (size to be specified) max run-out error < 2μm. Double vault arc prismatic slideways : 2 for X axis slideways, 1 for Z axis slideway. 3 x Double re-circulating ball bearing slides, lubricated for life (preloading slides/slideways: P/H class). Spindle-holder with motorized tool-clamping system. Universal mechanical tool clamping (standard pull-studs) managed via software. Control via software with sensor of empty for the exact position between the tool-holder axis and the machine spindle axis, no error of concentricity. Pneumatic-mechanic braking of the spindle-holder rotation with radial compensation of the clamping force: no axis angular run error. Episcopic illuminator with ring lens and red LED’s ; diascopic illuminator with red, puntiform light LED. Data storage on solid state disk SSD. X and Z axes block management with control maximum speed of translation 2mm/sec. Tool list creation and/or single tool. Tool sets and Post Processor universal generator. Magnetic chip code-holder (Balluff for example, hardware not included). Axes resolution: X= 1μm, Z= 1μm. Overall dimensions: Length = 1240mm, Height = 1840mm, Depth = 558mm.